People experience time in ways that are basic to their culture’s calendars and thinking. Three thousand years ago, calendars and water clocks were dynamic and non linear, adjusted to fit nature’s rhythms. (The Babylonians and Egyptians measured different amounts of water into their clocks so a military watch would shorten or lengthen to fit the variations in days and nights). God promised that nature’s patterns would repeat: while the Earth remains, seedtime and harvest, summer and winter, day and night will not cease (Genesis 8:22). However, biblical chronology cannot be arranged with equal spacing on a line because the biblical authors (like everyone in their era) could not imagine linearity. Jacob claimed that his days and years were shorter and worse than the days and years of his fathers (Genesis 47:9). He was not a linearist. He knew that his father Isaac lived five more years than his grandfather Abraham. Western people got their linear ideas by combining Christianity with philosophy. Plato’s Timaeus claimed everything is “coming to be different at different times” except for a craftsman god who created everything. The craftsman “always is and never becomes.” Plotinus claimed Plato’s philosophical god is changeless, outside of time. Augustine adopted Plotinus’ god as a model for the biblical Creator. He imagined that God created time, is not in time and sees the future. If God sees the future (like frames on a movie film) then time must actually exist. The Bible never admits to Augustine’s philosophy. The Biblical God is not absolutely changeless. He changes His mind, not because He is fickle, but because men willfully rebel (1 Samuel 15:11) or he sends someone to get them to repent (Jonah 4:2). He actively implements predicted judgments against the willful wicked (1 Kings 22). When He chooses to save a specific person is aorist, without reference to when, in the Greek text. Since He is answering prayers, evidently he is actively bring about his plans for the future, without ever deceiving anyone or doing evil. Medieval scholastics used the notion that God is absolutely changeless, to imagine that substances have an unchanging essence. The notion that matter is intrinsically unchanging is fundamental to ideas about linear clocks and fixed orbits. The Apostle Paul stated that the creation is enslaved to change (Romans 8:21). Universal changes affect durations. The Bible repeatedly calls the Old Testament era the eons (olam). Jesus came at the terminus of the eons to put away sin by the sacrifice of himself (Hebrews 9:26). Job, who lived in the dinosaur age, recorded the geological events that passed during the few days of his life (Job 14). One of his markers for a lifetime was the sea (Hebrew west) dried. 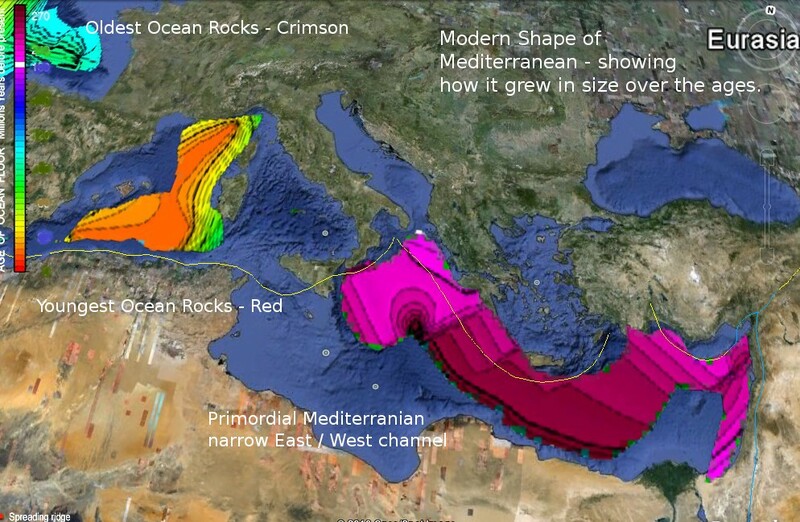 We confirm that the Mediterranean dried repeatedly from the thick plankton layers alternating with salt and gypsum in the Mediterranean seafloor. The map of the relative ages of the Mediterranean is from NOAA. The oldest ocean floor on Earth is in the eastern Mediterranean near Job’s home. This ancient sea dried at least eight times, according to the layers in the seafloor. Job also claimed their faces changed (doubled) before they died. If we lived for geological ages, our faces would grow Neanderthal brows. This is the skull of a Neanderthal old man from Gibraltar. Notice the extended brows. The picture is licensed under Creative Commons Attribution Share Alike by AquilaGib from wikipedia. Neanderthal child skulls do not have the thick brows of their “grandparents.” This is the reconstructed face of Neanderthal child, whose skull came from the same general area of Gibraltar as the skeleton of the old man above. The child seems to have been about four years old when he died. Yet this child’s teeth had laminate striations and worn enamel as though he was very old, yet still a child. Hesiod claimed a child in antiquity played at his mother’s knee for a hundred years (See Works and Days – silver generation. 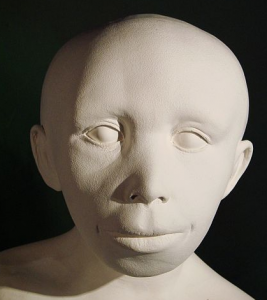 This photo of the facial reconstruction of a Neanderthal child is licensed under Creative Commons Attribution Share Alike by Guerin Nicolas from wikipedia. Jesus made the plural eons (Hebrews 1:2). How could eons coincide with a world only 6,000 years old? The Apostle Paul said our “time is short” (kairos sustello – contracted – 1 Corinthians 7:29). Evidently the present is short but ancient years were eons in few days. Hebrew 11:3 By faith we understand that God once for all passively prepared the eons by His command. He did not create time. According to this passage, the plural eons passively formed from things not seen. What does it mean – eons formed from things unseen? According to the Bible, He continued to form the Sun, Moon and stars and continued to make them into things that spread out (Hebrew noun raqiya). He continues, in unbroken continuity, to call the stars to come out, yet none go missing (Isaiah 40:26). We observe blue globs packed with tiny stars in equally spaced chains around the redder core of many primordial galaxies. Matter that continues to change relationally as the stars move outward are evidence for accelerating orbits, not linearity. The picture at the head of this article is Hubble Ultra Deep Field galaxy 3031. This ancient galaxy has two arms made of discrete, bluish globs evidently packed with primordial stars. It also has an offset bar and a child galaxy at the end of one of its arms. This is evidently what M51 (the Whirlpool galaxy) looked like long ago. The atoms in this ancient galaxy shine at 42% of the light frequencies of modern atoms. 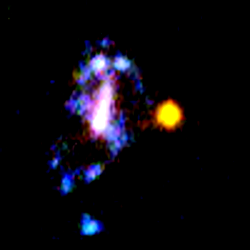 This picture shows emerging star streams in somewhat more mature (closer) galaxies. It is from NASA, ESA, the Hubble Heritage (AURA /STSci)-ESA Hubble collaboration and A. Evans (University of Virginia, Charlottesville/NRAO/Stony Brook University. 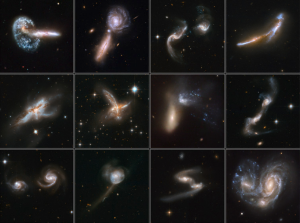 Scientists often claim these are colliding galaxies because they have faith that matter does not change itself relationally with age. Yet we observe in billions of galaxies in all directions how stars continued to form and spread out. Trillions of star streams emerged and spread out from the unformed matter God created on day one. Someone might claim, this is incompatible with a universe that is only 6,000 years old. Please look at the universe with sight instead of faith in atomic perpetual motion, which is the basis for scientific empiricism and the mathematical laws of physics. Not a single clock in the universe is linear. We observe in the history of galaxies how the atomic clocks accelerate along the outward accelerating star streams. The visible history of how galaxies formed by growing from the unformed matter in the core of each galaxy is powerful evidence for a literal biblical creation. Scientists pack the cosmos with magical things: spreading vacuums, black holes, vacuums that stretch light and 84 % of the matter in the universe is invisible. Why? They must protect their creed upon which their system was built, their supposition that clocks and orbits are both linear.